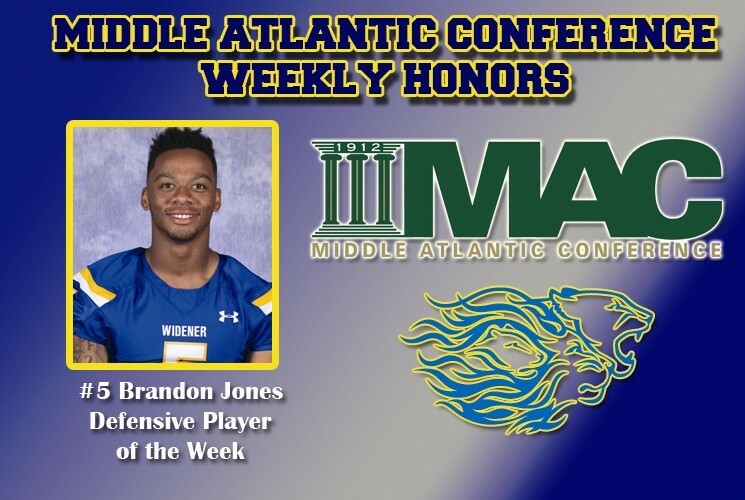 MAC Football News: Widener Football - Brandon Jones Named MAC Football "Defensive Player of the Week"
Widener Football - Brandon Jones Named MAC Football "Defensive Player of the Week"
ANNVILLE, Pa. (Oct. 19, 2015) – Senior captain Brandon Jones (Baltimore, Md.) of the Widener University football team has been named the Middle Atlantic Conference Defensive Player of the Week, as announced by the league office. Jones recorded seven tackles, including four solo, and also had 3.5 sacks and tackles for a loss totaling 28 yards in Widener's 40-10 rout of Misericordia on Saturday. He also had a pass break-up and forced a fumble on one of his sacks. Jones and the Pride defense held the Cougars to just 208 total yards of offense. The announcement marks the second straight game that a Pride standout was named the MAC Defensive Player of the Week, as senior Stacey Sunnerville (Freehold, N.J.) received the honor for his performance in the 27-7 victory over Wilkes earlier this month. Senior Ryan O'Hara (Royersford, Pa.) has also been recognized with a weekly award as the MAC Special Teams Player of the Week this season. Widener (4-2, MAC 4-1) visits Stevenson for a pivotal Middle Atlantic Conference matchup on Saturday, Oct. 24 at 1:00 p.m. The game is expected to be a sellout as part of Homecoming Weekend at Stevenson.